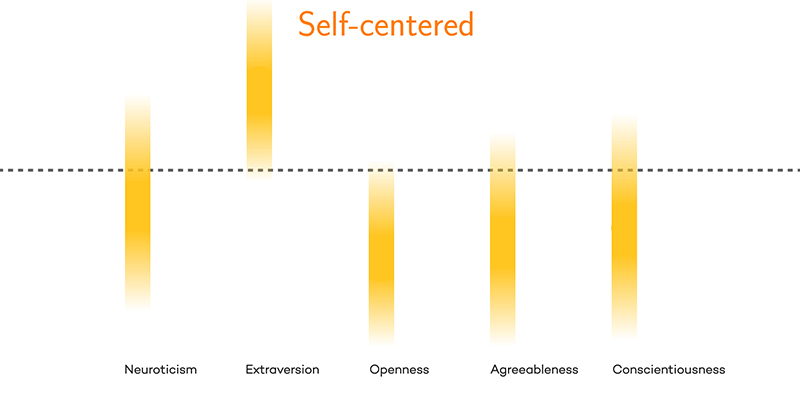 Northwestern researchers sort through lots of data and find four personality types, challenging existing paradigm. A new study led by Northwestern Engineering’s Luís Amaral sifted through data from more than 1.5 million questionnaire respondents to find at least four distinct clusters of personality types exist — average, reserved, self-centered, and role model — challenging existing paradigms in psychology. That self-centered person. The role model. The average guy. The reserved one. Throughout human history, people have tried to classify each other by describing personality types. The ancient Greeks described the four humors, a theory that personality results from a mixture of bodily fluids. Psychiatrist Carl Jung defined eight types, which Katharine Cook Briggs and her daughter Isabel Briggs Myers expanded into the 16 Myers-Briggs types. Such descriptions may be used to help sort through job applicants or potential dates, but most researchers doubt that personality types even exist. “People have tried to classify personality types since Hippocrates’s time, but previous scientific literature has found that to be nonsense,” says William Revelle, professor of psychology at Northwestern University’s Weinberg College of Arts and Sciences. Northwestern Engineering’s Luís Amaral and his colleagues challenge that paradigm in a new study. Sifting through data from more than 1.5 million questionnaires, his team found evidence for the existence of at least four distinct clusters of personality types — Average, Reserved, Self-Centered, and Role Model. The new research, published in Nature Human Behaviour, combined an alternative computational approach with publicly available data obtained from four questionnaires developed by researchers over decades: both the long and short versions of John Johnson’s IPIP-NEO, the myPersonality project, and the BBC Big Personality Test datasets. “The questionnaires ask how strongly the respondent agrees with statements such as ‘I get anxious when I have to meet new people,’” says Amaral, co-director of the Northwestern Institute on Complex Systems (NICO) and the Erastus Otis Haven Professor of Chemical and Biological Engineering. “The thing that is really, really cool is that a study with a dataset this large would not have been possible before the web,” Amaral notes. 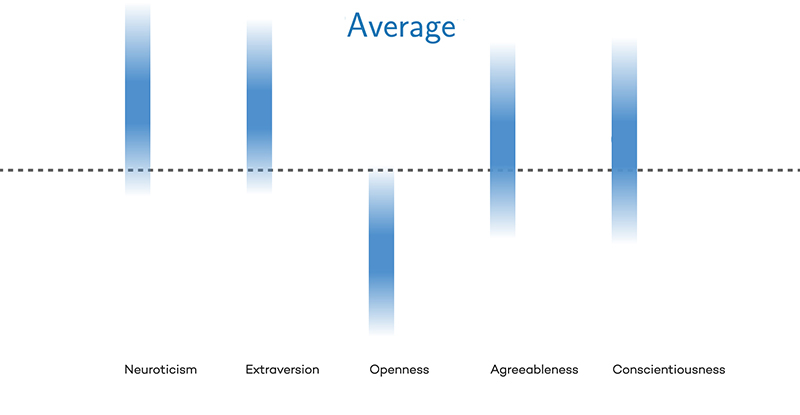 Average people are high in neuroticism and extraversion, while low in openness. Females are more likely than males to fall into the Average type. 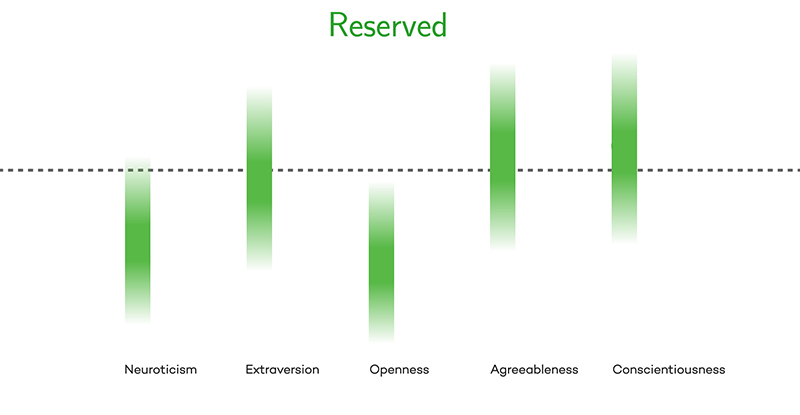 Reserved individuals are emotionally stable, but not open to new experiences. They are neither neurotic nor particularly extraverted, and are somewhat agreeable and conscientious. 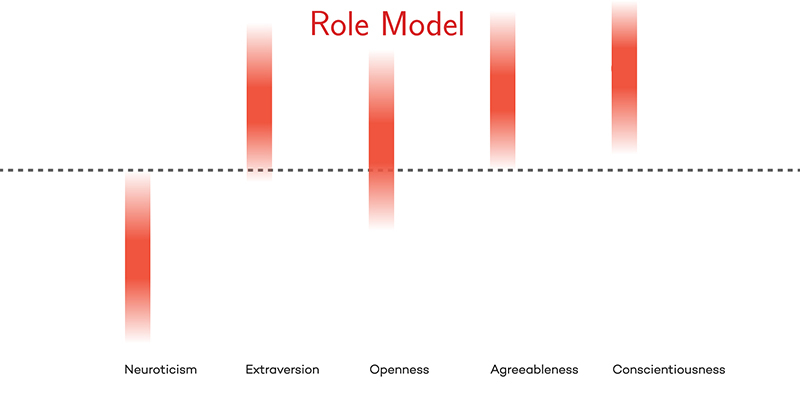 Role Models score low in neuroticism and high in all the other traits. The likelihood that someone is a role model increases dramatically with age. More women than men are likely to fit the Role Models cluster. During the initial research stages, the team, including Martin Gerlach, a postdoctoral fellow and the paper’s first author, tried to identify psychologists with whom to collaborate. One name kept coming up — William Revelle. He specializes in personality measurement, theory, and research, but when the team approached him, he was skeptical of the study’s premise. Because previous attempts to classify personality types were based on small research samples, and the results often were not replicable, the concept of personality types remained in poor standing among psychologists. The team’s first attempt to sort the data used traditional clustering algorithms; that yielded inaccurate results. “At first, they came to me with 16 personality types, and there’s enough literature that I’m aware of that says that’s ridiculous,” co-author Revelle says. “I believed there were no types at all.” He challenged Amaral and Gerlach to refine their analyses. In response, Amaral says, “We developed a new method to guide people to solve the clustering problem that performs a sanity test on the findings.” The new algorithm first assumes that there are a large number of clusters and uses traditional methods to find them. Then, those clusters are winnowed down by imposing sanity check constraints. This procedure robustly identified four groups across the datasets. The research was funded by a gift from Mac and Leslie McQuown along with support from the US Department of Defense Army Research Office and the National Science Foundation. To be sure the new clusters of types were accurate, the researchers used a notoriously self-centered group — teenaged boys — to validate their information. “We know teen boys behave in self-centered ways. If the data were correct and sifted for demographics, they would turn out to be over-represented in the Self-Centered cluster,” Amaral says. Indeed, young males are overrepresented in the Self-Centered group, while middle-aged females are vastly underrepresented. And good news for parents of teenagers everywhere: As people mature, their personality often changes. For instance, older people tend to be less neurotic yet more conscientious and agreeable than those under 20 years old. Related story: Are You Average, Reserved, Self-Centered, or a Role Model?